They’ve proven they can handle the Ulster Championship favourites tag but Derry minor manager Damian McErlain believes his team will need that same maturity to secure an All Ireland semi-final place when they meet Sligo in Ballybofey on Saturday (2pm). 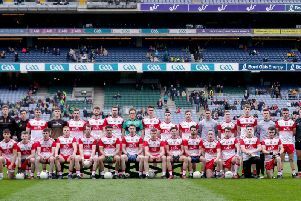 The Oak Leafers go into the game without Lorcan McWilliams who hurt his hamstring early in the Ulster final victory over Cavan and his absence could see Tiarnan McWilliams shift to full forward against a side Derry have met twice in challenge games this season. Sligo defeated Leitrim (3-12 to 3-07) in the Connacht semi-final before losing to Galway in the decider by 3-11 to 0-11, a statistic which dictates McErlain’s team will be expected to progress, not that the Maghera man puts much wight on pre-match labels in championship football. “I never read too much into things like that. I suppose the good thing is we were slight favourites for the Tyrone game and strong favourites every time since but we coped with it well,” said the Derry manager. “It shows the mental strength that this group has. They realise the onus is all on ourselves, if we don’t show up from a hunger point of view and work rate point of view, then we are in for a long afternoon. “Thankfully the group has been very mature so far in the way they have approached the Ulster final but we are going into a different venue now and a very different occasion. There won’t be as big a crowd and it won’t be as big an occasion so we have to lift them again and get them ready for it again. The psychological side of the game is an area McErlain puts a real emphasis on and he has been impressed with how his young team have responded when put under pressure in the Championship this season. “That (the attitude) was the most pleasing thing about the final against Cavan,” he explains, “Every time Cavan got a score, and I suppose the two goals were the big scores from their point of view, but each time they scored we responded and hit the next few points. “For me, that was indicative of where this group is at but we’ve had that feeling about this group. After each game they have come back and reset. There has been no giddiness. Even after the Ulster Final, they had their celebration night on the Sunday but were back on the beach training the next day and continued with their preparations. The main Sligo threat is likely to come from inside forwards Red Óg Murphy, who has 1-05 to his named in the Connacht Championship, and Conall Ryan although Conan Marron could be used in an advanced role. Derry are unlikely to shake things up dramatically from their normal game and will once gain look to the impressive pairing of Oisin McWilliams and Paudi McGrogan to control a game which will have something of the unknown about it despite the two challenge games between the counties this year. “We know them better than if we had never met them but the truth is you can never be sure what sort of side you are facing in challenge games. Obviously having met them, you have more of an idea than had you had never seen them, so you do have some perspective. “For example, had we drawn Clare, where do we get the information or perspective on them? The fact we have played twice gives a bit of a bearing but, again, we had a half team one day; they had a half team the other. The second time we had closer to a full team but they had no Under 17s playing so it all comes back to looking after ourselves. Sligo have conceded six goals in their two championship encounters to date - twice as many as Derry have in three championship games - and the westerners be expected to adopt a more defensive approach in Ballybofey this weekend. However McErlain believes the big pitch at MacCumhail Park might suit Derry more than Sligo. “The pleasing thing for us is that we have already played a league fixture there this season so there is no need to rush down and organise a training session or anything. It’s a pitch we would be quite familiar with. It is a fair size of a pitch. “The game could have been at Brewster Park, for example, which is a long, narrow pitch and might have suited Sligo a bit better as they like to crowd the middle of their defence so we are happy enough to be playing in Ballybofey.